LoveMyDog recently held a competition to find a new canine Kate Moss to help launch our new Featherstone tweed dog coat, specially designed for the greyhound and whippet shape. As always, a big thanks to all the dashing dogs that took part and congratulations to the winner Timmy who is pictured modelling the coat above. Cut especially for the lean bodyshape of greyhounds and whippets, this luxury dog coat is the stylish way to end the shivering cold that these breeds suffer from so easily. Created in a hand-woven, pure wool tweed with a fleecy lining, the coat is windproof , showerproof and easy to keep clean. Matching leads are also available from our Thornby Collection. 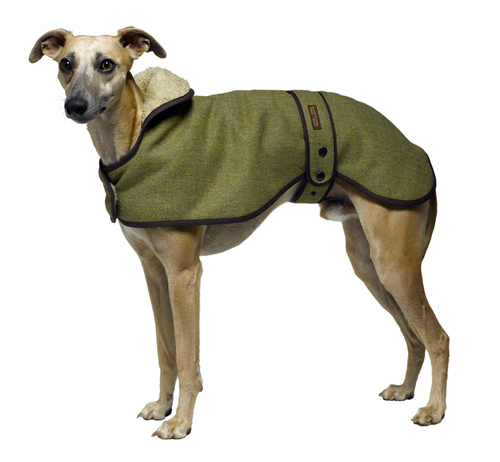 You can find out more about this stain resistant and showerproof Featherstone tweed dog coat here or see more of our designer dog coats.